A few years back my husband and I hired a business coach to help us write a growth plan for our business. After nearly two decades of operating our company, we wanted fresh eyes to help us see new directions. The business coach gave us a number of written exercises to do, including listing our personal and professional goals. The business coach was shocked. I was shocked that he was shocked. Goal lists were for beginners, in my not-so-humble opinion, not long-time business people like me. I was at the top of my game with the successful career I always wanted. “If you don’t have specific goals you are missing opportunities,” he said with certainty. I was annoyed. Who hired this guy? What did he know? I agreed, because I thought it seemed a little farfetched. At our next session with the business coach, I confessed it had only taken a few days to see the mythical Q5. “But don’t tell me I made it come to me because I wanted to see it!” I warned. As a stubborn person who enjoys being right and having the last word, I found this lesson humbling. I wrote my (stupid) list of goals and gave this fellow his due respect. My newfound regard for acknowledging intentions came in handy as I embarked on a life of recovery. You may find that once you set a goal to stop drinking, you notice others who don’t drink. You start to see alternative beverages at the grocery store that never interested you before. You realize there are events in the evenings that don’t involve alcohol, and that people actually GO to these things and have fun without drinking. 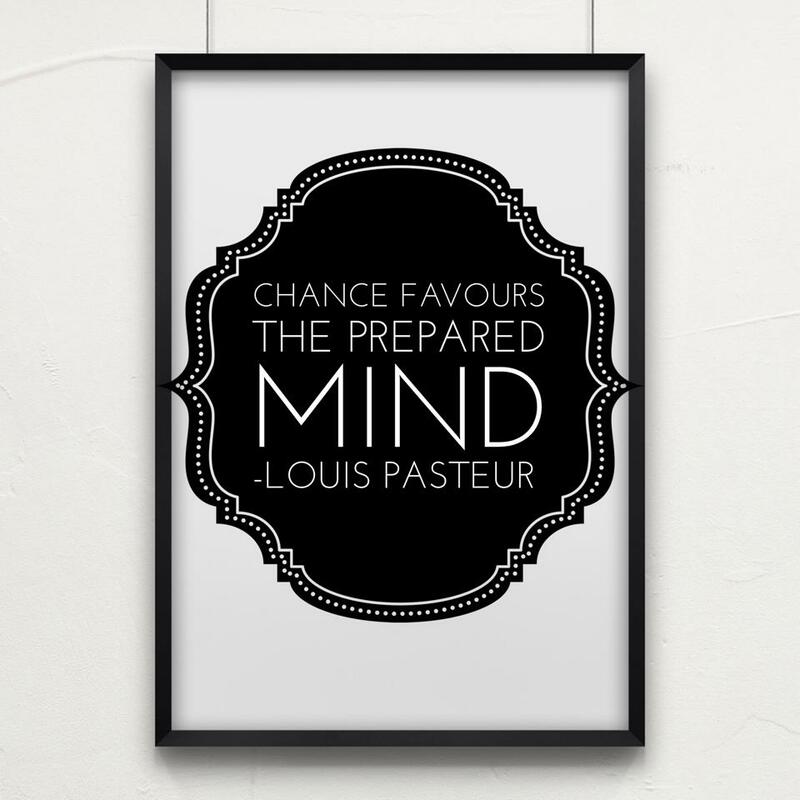 In the words of Louis Pasteur, “Chance favours the prepared mind.” Sometimes I think I am lucky to have a happy life, to be sober, healthy, active and surrounded by people I love. Then I realize that these things exist because I value them and actively seek them out – they aren’t luck at all. I’m becoming more and more impressed with this blog. After reading only two posts I realize that the kinds of decisions I came to just 3 days ago, my first day of sobriety, mesh so well with the positive results being discussed here. We all then set forth to talk about plans to achieve my good health: activities, expectations, measurements, etc. For the most part I was driving that discussion, and it was predicated on my own experiences as a business consultant. Goal setting is extremely important, but I can tell you from my academic training and from direct experiences with customers that those goals must be reasonable and should never overturn the things that already make you successful. Never forget that you can’t eat the whole elephant all at once. Cut it into little bites and take it at the rate that suits you. And one more thing: involve as many relevant stakeholders as possible. You’ll be amazed at how quickly the plan can be achieved. The power of intention is what I used to get to the point that I stopped drinking about 60 days ago. It took about a year of intention (several years of finding the intention), along with starting the healthy habits (exercising, eating right, drinking tea, etc) before I stopped – I didn’t mind that I stopped, actually was relieved that I stopped drinking – something I couldn’t imagine a year ago. I’m still in the beginning, but feel strong. I’ve made it through dinner parties, a superbowl, birthdays, family gatherings and my teenage daughter at her worst – all reasons/excuses to drink. I was going to wait to focus on new intentions/goals, because I didn’t want to focus on too much and get through the hardest parts of my new found sobriety first. I love the vision in Jean’s comment, “It reminds me to stay sober so that I can be a wise and admirable matriarch, not some sour sad old drunk.” Now that I’m not drinking, I want to live to be old and this comment sums it up. My intention is to model sober behavior for my kids. My intention is to give my daughter the space and support she needs to grow – I want her to be proud of herself, truly happy and find her productive niche in the world. My intention is to find and nurture friendships that are non-judgmental and supportive. I have many more, but this is enough to focus on for now – I’m still focused on the day to day and I have time to expand my intentions and goals – Thank you for the reminder! Beautiful – congratulations on two months! Appreciate your blog. I envy what you’ve accomplished. I’m always my best self mon-thurs… or sober at least.. most of the time anyway.. no real challenges due the the routine with work and caring for my toddler during the week so it seems to be much easier to turn off the craving. I read sober blogs, mind, body & spirit articles….then the wknd hits and all bets are off. As much as I know that steering clear will be so much better in the long run….. I am dealthy afraid of my feelings it seems… That’s when I want to drink most. Whatever it is, happy, sad, mad, anxiety…. Thanks for letting me share. Blessings. Ah Christina, I feel for you. It is so hard to get over that “hump” in the beginning – for some it is the weekend, for some it is family events, for others it is work-related drinking. I strongly encourage you to set yourself up for success. Get out a sheet of paper and make a schedule for the weekend ahead – what will you do Fri/Sat/Sun that will support staying sober? Book time for coffee dates (so you’re not lonely), buy ingredients for some elaborate meal (making it is one activity, eating it is another! ), get all the damn booze out of the house (obviously), binge on tv time, give yourself a mani/pedi — whatever your normally do that involves drinking, DON’T DO THAT! If you try and do the same stuff just without alcohol, you will miss it like crazy. Do things differently. Plan ahead. Enjoy yourself and reward yourself with each day that passes. It is hard but do-able. I am cheering for you!! Reading your post was helpful and brought me insight…I am here with almost 50 days alcohol-free, and I can’t quite put my finger on what my “best” self even looks like. I see a few elements of my best self: I do see my best self as sober, healthy and in control of my life. Responsible, a leader to my family and my community, someone who gives back to the world. Beyond that I’m not sure… Right now I’m happy where I am at because I am so happy to finally be at peace with the decision to be alcohol-free….right now, although I have about 10 different directions that my life could take (who knows…will I ever remarry? Finish my doctorate and be a professor? etc). My mind does seem to be all over the place…but the awesome thing is that I see myself alcohol free…which makes all the other things possible. I think as my mind and my life stabilize over the coming months, I’ll retry this exercise to gain clarity. Hmmm Jenn, maybe the question to ponder is “what does it FEEL like?” – don’t get sidetracked by the details you can’t predict. Just focus on how you want to feel about yourself. Does that help? Yes! That does help…immensely. I am good at focusing on outward goals, making a list then accomplishing the goal…funny how you picked up on my tendency to avoid looking inward. This is just the focus I need right now. Thank you Jean. That is funny! Isn’t it the truth tho, that it is so hard to look inward? Let us know how it turns out. Just listening to the Bubble Hour’s Getting Unstuck and very relieved to say “I’m done”. No more giving up for a while, no more trying to moderate. I’m done. Forever. Thanks for sharing, not just you but everyone! I have similar reservations about “The Secret” and all the manifestation stuff, for the reasons you talked about and also the flip side–the implication that anything bad that happens is brought upon oneself. And yet, there is something to all this, as your story illustrates. “What you practice gets stronger. What you focus on gets bigger. All of which is very applicable to the sobriety journey, and especially the second line in this case! That business coach is good at what he does. I love that quote you shared so much that I just put it on a graphic to post on my inspiration page and Facebook page. Thank you soberfire! I must say, having battled with my own addictiona issues as well I really connected with this blog post. You reminded me to not forget about re-evaluating and focusing on my personal and career goals – something that is exceptionally important for an addict. Especially when you admitted that “my newfound regard for acknowledging intentions came in handy as I embarked on a life of recovery. You may find that once you set a goal to stop drinking, you notice others who don’t drink. You start to see alternative beverages at the grocery store that never interested you before. You realize there are events in the evenings that don’t involve alcohol, and that people actually GO to these things and have fun without drinking,” it made me realize that I’m not the only one that has felt that way! Consider me a fan of your blog; I’ll definitely be back to read future posts. Will find a way to keep working but maybe have work be less draining. Will feel love from my husband, even though he is not very expressive. I will accept that the love is there and I will chose to bask in it. Will have an increasing power to connect with the present moment. To notice what is right here for me, and to experience that as bounty. Will continue to enjoy my kids, who I adore, and I will help them foster independence and wings. I will not be afraid of their journey, even when it separates us. I will rejoice that I have played a part in these autonomous beings. Will not have a recurrence of breast cancer. And should I have a recurrence (because that is not under my control) I will be brave, I will breathe. I will not let fear of a recurrence diminish me. will connect with friends, I will listen. will continue to love moving and strengthening my body. Will learn to garden. Will plant a fruit tree in my new back yard and I will nurture it. Keep writing, I so value your contributions! Two thumbs up! Cheers with my Sleepytime Tea!! Oh how I love that! I am in contemplation stage and ready to leap. Tender and hopeful. Sleepy time tea sounds safe and lovely. I find myself saying, why not me instead of why me….. Sobriety and recovery has helped me discover the real me and all that goes with the real me. Self awareness is not always easy but it certainly beats the way I used to live! Thank you for the awesome post! I saw your answer on another blog and it was wonderful! But I need extra time! Hi Anne. Here is the beauty in the exercise I proposed – it isn’t really a matter of what you need to change, but what does it look like to keep being you as time passes? Hold all the core values you’ve developed and see them played out against the aging of our faces and bodies, our relationships with our children as they become adults, the winding down of our careers. The strengths you have developed as a sober woman who accepts herself and treats her body with respect are characteristics that serve you well in both the short term and long term – this is at the heart of the exercise. My “future Jean” is a woman who moves thoughtfully through the world and fully engages in what’s before her at any moment. She isn’t checking her emails while babysitting the grandchildren, she is on the floor with them rolling out home made playdough. Future Jean skis into her 80s, meditates, volunteers at the hospital, and can afford to travel once or twice a year, although her favourite adventures are close-to-home camping trips in the old VW with the grandkids. She has natural wrinkles and great hair. Her style is current yet age-appropriate. She is trustworthy, respected, and well-informed. She is not a burden to others; she is strong and independent and a pleasure to have around. That woman I just described, I am on the right path to be her as I age. When I was drinking, I had the same aspirations for myself but knew that getting drunk every night was not leading me there. My vision reminds me to stay active so I am healthy enough to live the life I envision. It reminds me to plan my finances so I can afford to travel. It reminds me that I don’t need a tummy tuck not matter how much I wish my stomach was perfect. It reminds me to stay sober so that I can be a wise and admirable matriarch, not some sour sad old drunk. The goal is not to redirect you away from all you are, but to clarify what’s on track. You are wise to push against ideas of perfectionism and future-tripping – those are not the purpose of this exercise. The question, really, is whether you are heading in the direction you want to go. I think your answer is “yes”. Amazing post! It speaks so much to the fact that we can steer our ships in the direction we choose. Thank you! Excellent! This could apply to any obsession or addiction. The world is seen differently when the view is cleared of its repetitive sameness. As usual, timing is impeccable. My best possible self would have way less possessions and a variety of more true friends and a possibility of a potential significant other, someone special who was first of all a great friend and confidant. My best self would not overeat to disguise painful emotions and would get more exercise in spite of physical limitations to what exercise for me used to look like. My best self would be honest with me and others, would be supportive of me and others in healthy ways. My best self would have values and integrity that assure me its ok to be me and to allow me to allow others to see the real me. Oh my gosh, what can I say except yes, yes, yes! I love this blog Jean. Thanks for the post. This is brilliant! Such a simple concept and yet it makes so much sense… Thanks for this!